Sky Bet free bet club - £20 now and £5 EVERY WEEK! 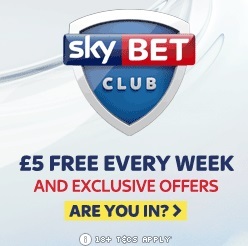 Join the Sky Bet club for a free £5 bet every week! The Sky bet club is the superb loyalty based offer from top UK bookmaker Sky bet. Worth over £250 a year, it’s the ongoing offer that just keeps on giving. This feature explains how the Skybet club works and how to ensure you maximise the potential when you bet each week. In short, it is essentially a loyalty program with a difference. Most bookies run loyalty programs that build up points over time, then once in a while you can cash them in for a free bet or a football shirt or something. The problem with these sort of programs is that they don’t actually give a huge amount of value back to the player. You might find you have to build up a colossal amount of points just to get a few quid in cashback for example. Sky Bet recognised that actually, the punters just want something simple that rewards their continued loyalty on a regular basis. Enter the Sky Bet club. The premise is simple, if you continue to bet with Sky, you’ll be given a free £5 bet every single week! Mounting up to an tasty £260 every year, this is an impressive offering. That’s a lot of money, what’s the catch? OK, I’ve joined, what now? As you can see on the screenshot here, none of the qualifying bets have yet been placed. You may also notice that there’s an additional offer here, we’ll explain that shortly as well, as it’s an enhanced extra you will be offered from time to time. So, going back to the standard weekly free fiver, what do you need to do to qualify? 1. You need to place bets totalling £25. 2. This figure does NOT have to be achieved in a single bet, all the qualifying bets you place throughout the week will be added up until you reach the target. 3. IMPORTANT! For any bet to qualify it must be at a price of evens (2.0) or higher. 4. You must not cash out your bet, it has to run to the end. How do you qualify for the club? You must opt-in to the Sky Bet club. You can do so when logged into your Sky Bet account. Eligibility for the weekly free bet. You must stake £25 of qualifying bets each week before midnight on Sunday. Qualifying bets? A qualifying bet must be at odds of 2.0 (even money) or greater. Cash out? No. Cashed out bets do not count. Free bet expiry. Free bets expire the following Sunday at midnight. Ensure you use them! Ongoing club membership. You will remain opted-in to the Sky Bet Club as long as you meet the criteria each week. If you fail to qualify for two consecutive weeks you will be automatically opted-out. You can opt back in later. Stick to the above, and you’ll find a free fiver in your account every single week. The £5 is credited every Monday by 7pm, and you’ll have until Sunday night to use it. Make sure you remember to wager it, otherwise it will simply expire and you’ll lose it. You might remember that a little earlier in this article we mentioned an additional extra as illustrated in the screenshot. From time to time Sky will give you the chance to double the free fiver up to a tenner! This is referred to as the enhanced free bet offer, and if it is available to you, your status bar will be shown as in the screenshot above. When this happens you have the option of qualifying for either the weekly free fiver, or doubling up to a tenner by staking £50 instead. There’s no obligation to do this, if you are comfortable with just betting the £25 each week for the standard club fiver, then continue to do this. If you are someone who bets a little bigger each week, then you might as well take advantage of the extra! There are a few other common questions about the club, we’ve tried to answer these for you below. If you have any further questions, it is probably best to contact Sky or check out their club homepage, which always has the updated information. Do winning bets count towards the club? Of course! If you qualify for the free bet, and all your bets have been winners then you’re quids in! The cash is yours to keep, and the fiver will still be in your account come Monday. Perhaps you’ve been on holiday or simply didn’t fancy a bet this week. You’ve failed to meet the weekly requirement to get your free fiver, so what happens now? The good news is that this has changed recently. In the past, it was a one strike and you’re out rule! This was a little unfair though, and following feedback, Sky realised this and brought in a new rule. Now if you miss a week (or more), you will be opted out until you qualify again. To qualify again, you need to make a slightly higher amount of bets, and this is currently set at £40. Essentially, for £15 extra, you buy back in and immediately qualify for the free fiver, so it’s only really costing you a tenner, well worth it to get back in. What if I don’t start betting with my new account straight away? After you join, you have a week to make the first qualifying bets. If you sign up but don’t start betting straight away, you will defer your entry into the club until you do start. However, note that once the first deadline has passed, you will be subject to the same terms as if you’d missed a week, as detailed just above. Can I use my free bet to qualify again? No. The free bet does not count against qualifying for the next weeks free five pound bet. Any! Simple as that. All you need to do is remember that your qualifying bets have to be at odds of 2.0 (even money) or above. Skybet is part of the huge Sky group of companies. It is a UK based company, and is fully regulated by the UK gambling commission. In short, you know your money and personal details are safe and secure when you stick with a trusted, onshore brand. All good reasons to give them a try today. 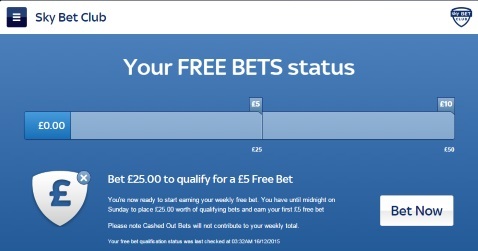 We hope you enjoy the Sky bet free bet club and that this article helps you make the most of your betting with them. Finally, remember that if you can get started now you can grab an extra £20!